Source: CICH graphic created using data adapted from the First Nations Regional Longitudinal Health Survey (RHS) 2008/10, National report on adults, youth and children living in First Nations Communities. https://fnigc.ca/sites/default/files/docs/first_nations_regional_health_survey_rhs_2008-10_-_national_report.pdf -accessed July 27, 2017. 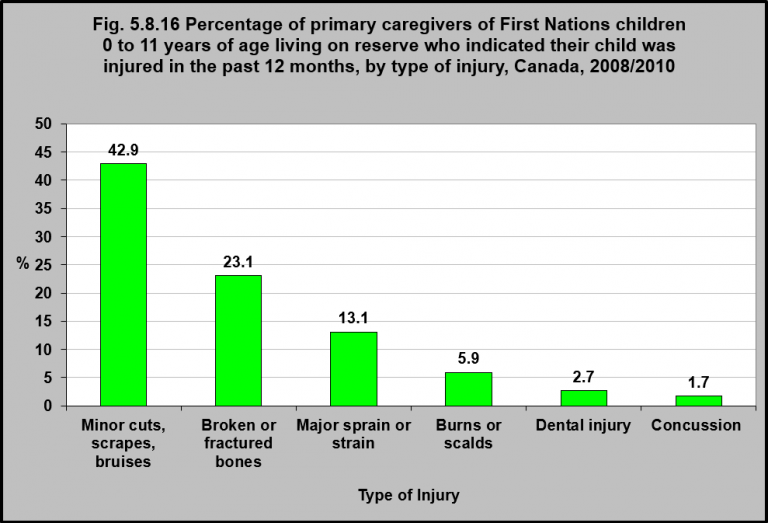 In 2008/2010, for First Nations children age 0 to 11 years living on reserve, the most common form of injury was minor scrapes, cuts and bruises, accounting for almost half of all injuries. 1The International Polar Year Nunavut Inuit Child Health Survey, 2007/2008. http://www.inuithealthsurvey.ca/pdf/Child_Inuit_Health_Survey_Aug_31.pdf-accessed August 10, 2017. Factors contributing to injuries among First Nations children include: low rates of seatbelt usage; increased use of alternative modes of motorized transportation such as snowmobiles and all-terrain vehicles (ATVs); the remoteness of many Indigenous communities which means traveling greater distances on poor quality or icy roads, as well as limited access to emergency rescue or medical assistance; increased access to bodies of water for recreation, transportation and food, coupled with lower usage of flotation devices; high rates of smoking, reliance on wood heat, poor housing conditions and lack of smoke detectors; as well as poverty and poor quality/overcrowded housing conditions. Injury prevention in Indigenous communities must take into account the socio-economic realities in which Indigenous people live, in conjunction with an individual’s own personal resources.